What a first day in the dunes of Dubai! Only 12 cars could finish today´s stage in the maximum-time - behind them the officials started a "Festival of Penalties" so that some competitors even after some 170 kms have more penalties than some Dakar-competitors after 5000 kms. In the cars, it was especially a fight between the European FIA World Cup leaders, after the local hero Sheikh Khalid Al Qassimi had to stop early after 70 kms and became second-last rated today. "Factory"-Mini against "Private"-Mini in front: Polish X-raid Mini Factory driver Jakub Przygonski from Poland and his Belgian navigator Tom Colsoul won the opening day’s 174 km special stage by 2:06 minutes from Russians Vladimir Vasilyev and Konstantin Zhiltsov in the second, private X-raid Mini in the second round of this year’s FIA World Cup for Cross Country Rallies in Dubai. 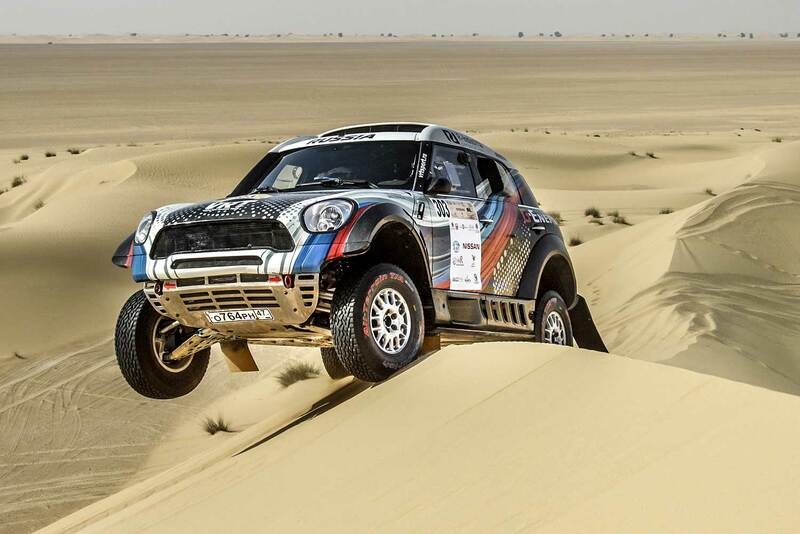 "It was a really fast stage in the dunes," said the stagewinner Jakub Przygonski. "I pushed hard and passed three cars (Prokop, Al Qassimi and Vasilyev). It was easy terrain, some soft sand and dunes, but no major issues." Saudi Arabia’s FIA T2-World Cup Champion Yasir Hamed Seaidan with Russian co-driver Aleksei Kuzmich were third fastest on the day another 3:37 minutes away in their Overdrive Toyota Hilux in their second race in the T1-class. "It was a great drive and the terrain was good with no problem. The car is running perfectly," the Saudi said after the stage. With Czechs Martin Prokop and Jan Tomanek fourth fastest in a Ford F-150 Raptor Prototype. 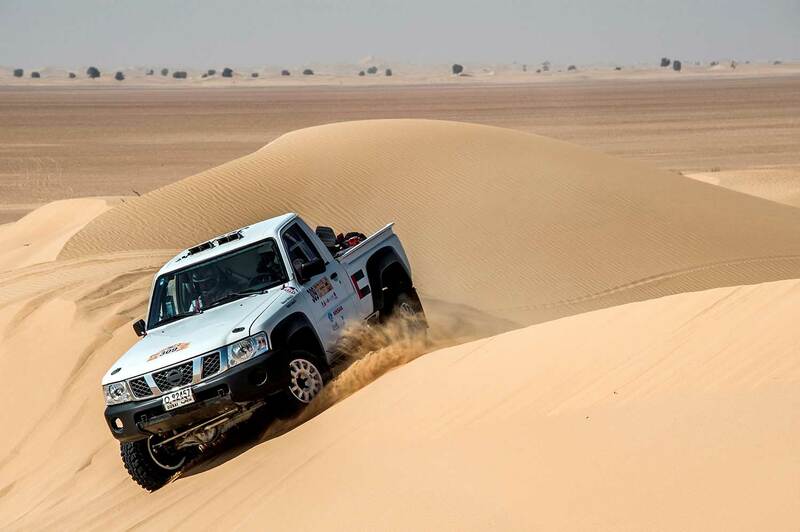 "We made one mistake near the beginning and got stuck on a dune but generally felt good about the race.” UAE’s Mansoor Al Helei and Khalid Al Kendi in a Nissan Pick up and Thomas Bell with Patrick McMurren in a Nissan Navara completed the top six. 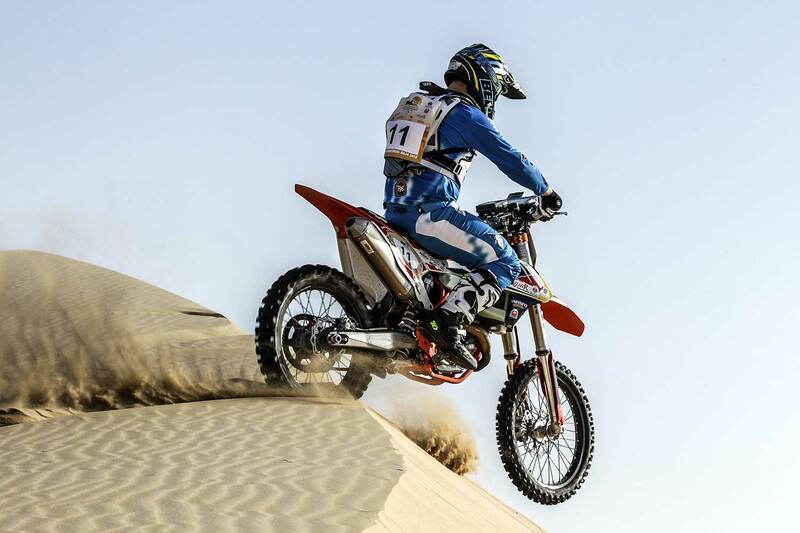 Lying ninth overall in a Polaris RZR, Ukrainian Vadym Prytuliak led the SSV category and was on course for a second successive Dubai Baja title. In the battle of the bikes, South African rider Aaron Mare grabbed a 32-seconds first leg lead from Kuwait’s Mohammed Jaffar in the first round of this year’s FIM Bajas World Cup, despite a crash which left him nursing sore wrists. "It was really good apart from a big crash coming off a dune. I hurt both wrists. The second part was fast with steep dunes and a lot of concentration needed," Mare said after the race. Second-placed Jaffar said: "I had an amazing day. The route was nice and the bike is much better than before. I felt very comfortable. It was a great ride and the bike performed well. It’s more about reading the desert than navigation." French rider Benjamin Melot, last year’s runner-up, is another 1:37 minutes away in third place. Top-seeded UAE rider Mohammed Al Balooshi was fourth fastest on the day, with his brother Sultan and Italian Manuel Lucchese completing the top six. "Opening the route isn't easy. There weren't any tracks to follow so it was really difficult for me but I made the most of it and I'm hoping for the best," said Balooshi. Aiming for a successful quads title defence in Dubai, Kuwait’s Fahad Al Musallam made the perfect start on his Yamaha 700 Raptor, opening up a 14:49 minutes lead over Russian rider Aleksandr Maksimov on another Yamaha. Mohammed Ben Sulayem, President of the Automobile and Touring Club for the UAE and Emirates Motor Sport Federation, and FIA Vice President for Sport, said: "We’ve had a very interesting first day and no-one can afford to relax because anything can happen in cross country rallying."